Lost Habitat - The Artworks of Amanda Jorgenson, et al. Group show with members of The Drawnk: a local drink and draw meet-up group in Seattle. Join me in my first live painting venture! I will be painting one of my flora and fauna creations (to be determined what exactly) live for you! Come by an ask me questions about how, why, what, etc. I do the art that I do. I will also have prints for sale! Join me on Monday, February 4th at 6:15 p.m. to view my art, and join me and other illustrators in discussing the relevance of Natural Science Illustration in the age of photography and technology. Light refreshments will be served. The event is free and open to the public. A show focused entirely on adaptations and reinterpretations of astrological signs selected by Push/Pull artists. Of course, being born at the outset of August, I’ve got LEO! Opening is 12/6 6pm-11pm and the show will be up all of December and January during the Saloon’s normal hours (2 p.m. - 12 a.m.). This is a great event to find incredibly affordable art for yourself, or as gifts. All work displayed is sold for $40. Work is sold off the wall, so not all work will be hung at once, but will evolve through the night. If you like beer, and you like art, this event is for you! My art will be hanging up at Flying Lion Brewing for 2 months. Go enjoy the taproom, a pint, and my artwork. I was selected as one of the artist to create 9 8 x 8 panels to raise money for art programing for the city of Burien, WA. VISON 20/20 – Each November at the Burien Community Center. This art auction is THE art event of the fall. Unique 8″ x 8″ pieces of art are all $40 each, together with a silent auction for larger pieces. Good food, wine, and exuberant company as well as music and prizes complete the evening. This is a critical fundraiser for Burien Arts’ programs. For more information or to exhibit at Vision 20/20. I was one of 40 artists selected to represent the Pacific Northwest. While the reception is one night, the exhibit will be up until November 30th, 2018. Join us as we kick off a month-long visual arts showcase of female-identifying artists of the Pacific Northwest! "Transform" is Siren Nation's 13th annual multidisciplinary showcase for local visual artists. 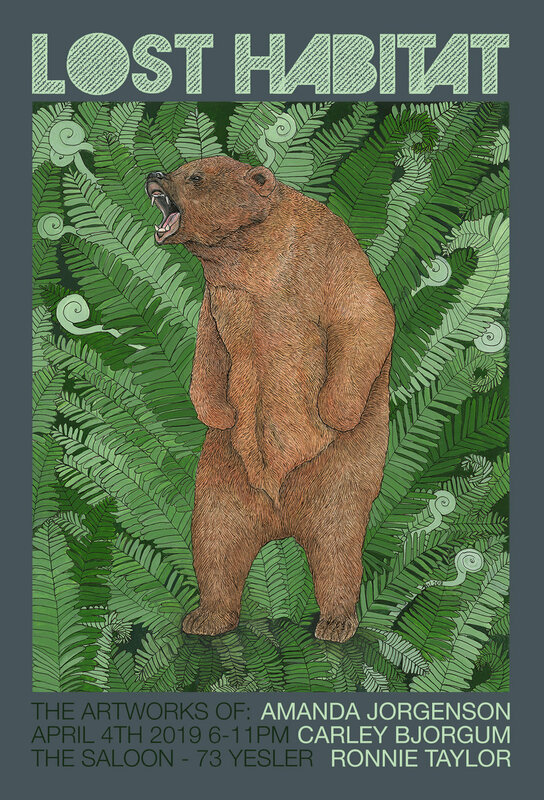 Enjoy a range of artworks done in pen & ink and watercolor, of members in the Animal Kingdom featuring natural science renderings, as well as whimsical children's book art. A few oldies but goldies plus some of my Flora & Fauna/B & W Bird Series on display at Front Seat Gallery in the OddFellows building in Capitol Hill, Seattle, WA. More information to come about opening during Capitol Hill Artwalk in October and November. Fremont First Friday Art Walk brings together a number of our neighborhood’s arts-supporting shops, galleries, and restaurants each month for 3 hours of celebrating creativity in its many forms. Expect to see everything from oil paintings to encaustics, photography to illustration, sculpture to mixed media, and live music to performance poetry. Along the way you can stroll by Fremont’s many outdoor art installations (most notably the Lenin statue, the Troll under the Aurora bridge, and the Rocket) and try locally made wine, beer, coffee, chocolate, and other delectable fare from local establishments, plus a steady rotation of mobile food trucks scheduled for the 6-9pm event. The FIRST FRIDAY of every month is a great opportunity to get a taste for the creative culture that Fremont is known for. We’ve got your fives senses covered here at the Center of the Universe. I’ll be displaying my black & white pen & ink owls (burrowing owl and barn owl) at the SW Branch of Seattle Public Library. The display is up from September 30th - October 31st, and there is a reception/meet & greet on September 30th! As part of the 27th Annual Southwest Artist Showcase, meet your creative neighbors and see their art on display at the Library! Description This reception is a chance to discuss art with the artists in a low-key, friendly setting. Artists participating in the Showcase are encouraged to attend the reception. Coffee and dessert will be served at the reception. The 27th Annual Southwest Artist Showcase is a non-juried, nonprofit exhibit and artwork will not be offered for sale at the Library. Visitors interested in purchasing artwork will be referred to the artists. Artwork by Southwest community members will be on display at the Southwest Branch from Sunday, Sept. 30 through Wednesday Oct. 31. Sponsored by the Friends of the Southwest Branch Library. Currently at The Leary Traveler: Prints of the black & white Pacific Northwest bird series, as well as 4 of my Flora & Fauna Carnivore series. Come tour the culture of Ballard during Ballard Night Out. Venues all over Ballard will be opening their doors to show off beautiful art, photography, glass and crafts. Check out our website: ballardnightout.com for the latest listings and map. STATIX and The DRAWNK present ARTCADE! Over the past summer, local artist community, 'The Drawnk', and the Downtown Seattle Association collaborated to bring art games to Occidental Square every Tuesday. Over 50 artists worked together to build county fair inspired games with an artistic flair. This show is a celebration of that project, and an exhibition of the artwork that it was built from. There will be art to look at, games to play, prizes to win, beer to drink (thanks to Pabst), music to hear (52KINGS!) and FUN TO HAVE!!! Original artwork, including all 6 Flora & Fauna pieces as well as pen & ink bird series.